**21-track compilation charting the rise of underground punk across the USA. 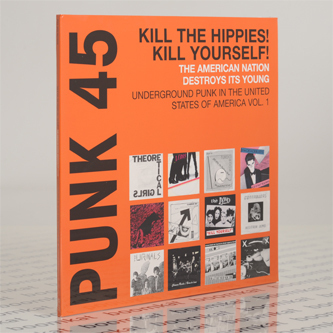 Features tracks by Pere Ubu,The Zeros, X Blank X, Theoretical Girls, plus 35-page booklet with writing by Jon Savage, Geoff Travis, and Peter Saville among others** "Punk 45: Kill The Hippies! Kill Yourself! The American Nation Destroys Its Young - Underground Punk in the United States 1973-80 is the first in Soul Jazz Records’ Punk 45 series of album releases coinciding with the new book and will be followed at the start of next year by Punk 45 Vol. 2 Underground Punk in the UK. 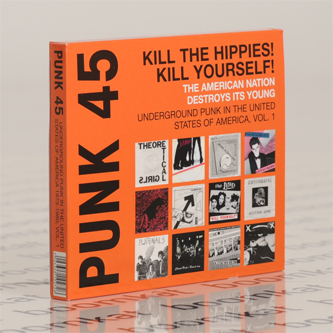 The Punk 45 album features a collection of seminal, classic, obscure and rare punk and proto-punk 45 singles from the likes of Pere Ubu, The Zeros, The Randoms, Electric Eels, The Pagans, The Deadbeats, The Lewd and many more - a lightning rod journey across the states of America - Cleveland, Detroit, Los Angeles, Akron, New Orleans, Philadelphia – tracing the rise of punk music in these various towns and cities. The album comes complete with extensive text, biographies on each of the bands, exclusive photos and original record artwork. The album is released on CD with outsize large booklet and thick slipcase and is also available as a limited-edition super-loud, super-heavy double gatefold-sleeve vinyl editions with full sleevenotes. This is also the first release that Soul Jazz Records are making available as a worldwide digital release."